Our Compressed Air Fittings or Piping Solutions includes Aluminum Pipe (compressed air / vacuum / inert gases) and PEX Pipe (compressed air / vacuum / inert gases / cold water / pure water / food grade media / oil / weak acids / alkalis). We also offer special fittings for hot water / tea / coffee /high temperature media. A compressed air system is much more than just an air compressor. 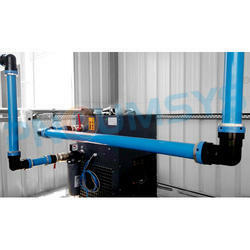 A basic compressed air system is made up of the following components: The Air Intake Filter is a device composed of fibrous materials designed to trap atmospheric airborne particles such as dust, pollen, mold, etc. before they can reach the compressor. The John Guest range of push-fit fittings and provide the ideal connection from compressor receiver to air line service components through to complete ring main and take off points. 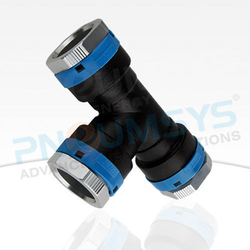 No need to prepare threaded pipe or solvent, all the connections can be made with a simple push-fit action. Compressed systems can be assembled much more rapidly than with traditional methods and because fittings are easy to disconnect, systems can be altered or extended with much reduced production down time. They are intended for use with John Guest nylon pipe but can also be used with copper or aluminium pipe. Codice Part Number Lung. Lenght PN NP /mt Tubi/Fascio Tubes/Bundle Kg. Tubi/Pallet Tubes/Pallet Kg. Our connecting system is a weld-less, thread-less way to join pipe. It has a successful history in the most demanding environments where fire safety is essential as well as a quick and easy solution to maintenance repairs. Using a portable, hand-held installation tool, couplings are cold worked and permanently compressed onto the piping, thus forming a permanent leak-tight seal. There are three seals: a metal-to-metal seal, an inner O-ring seal, and an outer O-ring seal. 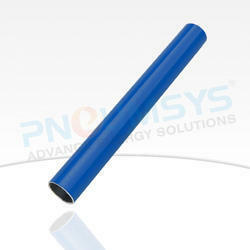 The outer o-ring seal prevents outside contaminants from entering the system. 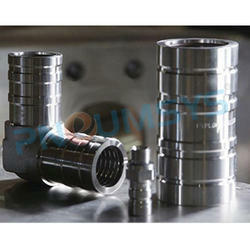 Couplings are available in Carbon Steel, Stainless Steel Type 316L and Copper Nickel 70/30. Available in sizes from 1/4” to 4” nominal pipe, from 6mm to 60mm metric tube and from 1/4" to 2" O.D. tube. Allowable pressure up to 9,300 PSI (640 BAR). The O-ring seals are made of Viton-E and have an operating temperature range of –65° F to +400° F (–54° C to +205° C). The use of the Tube-Mac PYPLOK® connecting system eliminates the extensive requirements and costs of welding such as a welder and consumables, hot work permits, fire watch, flushing and purging, gas freeing, radiography and certification. Repairs and pipe installations can be made safely, quickly and easily with the PYPLOK® System, minimizing the duration of shutdown periods. Our fittings are permanently swaged in "seconds" - reduces on-site time and labor. 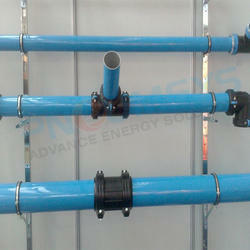 Our fittings are swaged on pipe/tube cold, no hot work permits or fire watch personnel are required. Our tooling is hydraulically actuated deleting special site services. Our system prevents the need for Gas Freeing. Our systems do not require acid pickling and neutralizing - eliminating the environmental issues relating to the disposal of such chemical wastes. Pneumsys eliminates the time and cost of NDT (radiography, x-ray) requirements. Our fittings are verified with a "Go-No-Go" inspection gauge - much quicker and less costly than NDT.